These cold winter nights are perfect for getting warm and cuddly on the couch, drinking hot cocoa and watching a classic vampire film – and what better film than today’s film flashback – Vampire Lovers. This 1970 flick was the first in Hammer Films Karnstein Trilogy, based loosely on Sheridan Le Fanu’s “Carmilla.” The film had an outstanding cast including Ingrid Pitt, Madeline Smith, Peter Cushing, Pippa Steele, Douglas Wilmer and Ferdy Mayne. On top of being a fantastic movie for Hammer fans, Vampire Lovers also gets points for being the late Ingrid Pitt’s very first vampire film. In Vampire Lovers, Pitt portrays the lesbian vampire Carmilla Karnstein, and she plays the part perfectly. She is still known today for her sexuality and her ability to seduce not only her victims in the film, but her fans watching. Lots of spoilers ahead! So if you plan on watching the film and don’t want the story ruined, don’t read! I t is 1794 and following the death of his sister, Baron Joachim von Hartog (Douglas Wilmer) vows to destroy the vampire Karnstein family. He succeeds in staking every Karnstein except for one – Mircalla Karnstein. Fast forward several years later. General Speilsdorf (Peter Cushing) is throwing a birthday party for his lovely niece Laura (Pippa Steele). Everyone has been invited, including Laura’s friend Emma Morton (Madeline Smith), Laura’s boyfriend Carl Ebhardt (Jon Finch), a Countess (Dawn Adams) who has recently moved into a nearby castle, and the Countessa’s daughter Marcilla (Ingrid Pitt). Suddenly, the Countess is called away due to the death of a friend, and Marcilla stays as the Speilsdorf’s guest. Marcilla and Laura quickly become good friends, so good that Laura stops seeing her boyfriend. Soon, Laura begins having nightmares of a cat strangling her and she then grows paler and weaker, and the doctor diagnoses anemia. It is not until Laura dies and the doctor listens for her heartbeat that two puncture wounds are found on her breast. To makes matters worse, Marcilla has disappeared. One day, while out riding, Emma and her father come upon a damages coach bearing a Countess and her niece Carmilla (Ingrid Pitt in a dual role), on their way to tend to the Countessa’s dying brother. Emma and her father invite be a guest at their home. Like before, Carmilla and Emma become fast friends. Soon, Emma has horrible cat nightmares too and begins growing paler and weaker. When the doctor is summoned, he places garlic flowers around the room and a cross on Emma’s neck. When Carmilla attempts to visit Emma, she is thwarted by the cross and the garlic. Emma’s father is summoned home from Vienna. On the way, he meets up with General Spielsdorf, Baron Hartog, and Laura’s ex-boyfriend Carl. Hartog tells them about his past with the Karnstein family. He leads them to Karnstein castle where he points out a painting of Mircalla Karnstein. “Marcilla!” says General Spielsdorf. “Carmilla!” says Morton. Meanwhile, Carmilla has convinced the staff to remove the garlic and cross from Emma’s room. She attempts to escape with Emma but is stopped by Carl. Back at Karnstein castle, Spielsdorf, Hartog and Morton see the vampiress return to her grave. They then destroy her. Definitely one of the top adaptations of “Carmilla” even though most of the characters have their name changed and our ingenue is given a male romantic interest (sans personality). What really sticks out for me is Miss Pitt’s performance. She seems genuinely in love with Madeleine Smith’s character, and to not particularly like being a vampire. At the end, she looks like she welcomes her own end. My favorite Carmilla adaptation! I love the wonderful, almost cozy Gothic atmosphere of this film. Plot – beautiful, dangerous but tragic female monster in beautiful 19th century home – is fascinatingly used and has some echoes of another Hammer masterpiece, Hands of the Ripper. I’m unsuccessfuly trying to find out why the first Karnstein movie, from 1964, with Christopher Lee, sometimes called “teror from the crypt” is never mentioned. It’s *almost* identical to this one in plot, and is not a Hammer movie, AFAIK. 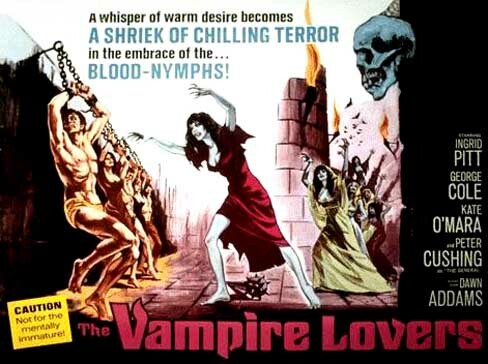 What’s the story behind it, and Hammer’s blatant copying of almost everything in it for “the vampire lovers” ? Anyone?